The Human Protein Atlas (HPA) is a Swedish-based program started in 2003 with the aim to map of all the human proteins in cells, tissues and organs using integration of various omics technologies, including antibody-based imaging, mass spectrometry-based proteomics, transcriptomics and systems biology. All the data in the knowledge resource is open access to allow scientists both in academia and industry to freely access the data for exploration of the human proteome. The Human Protein Atlas consists of three separate parts, each focusing on a particular aspect of the genome-wide analysis of the human proteins; the Tissue Atlas showing the distribution of the proteins across all major tissues and organs in the human body, the Cell Atlas showing the subcellular localization of proteins in single cells, and finally the Pathology Atlas showing the impact of protein levels for survival of patients with cancer. The Human Protein Atlas program has already contributed to several thousands of publications in the field of human biology and disease and it is selected by the organization ELIXIR (www.elixir-europe.org) as a European core resource due to its fundamental importance for a wider life science community. The HPA consortium is funded by the Knut and Alice Wallenberg Foundation. Thul PJ et al, 2017. A subcellular map of the human proteome. Science. Uhlen M et al, 2017. A pathology atlas of the human cancer transcriptome. Science. The full publication list is available here. Myosin, light chain 7, regulatory. 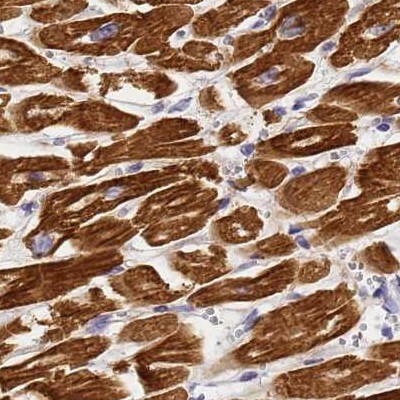 Selective cytoplasmic expression in cardiomyocytes at the protein level, highly tissue enriched in heart muscle at the mRNA level. In addition to the standard tissue setup, extended tissue profiling is performed for selected proteins, to give a more complete overview on where the protein is expressed. Extended tissue samples include mouse brain, human lactating breast, eye, and additional samples of adrenal gland, skin and brain. The mouse brain atlas provides a more extended overview of the brain proteome. In the standard analysis performed in the Tissue Atlas three forebrain regions (cerebral cortex, hippocampus, and caudate) and one hindbrain (cerebellum) region are included. Immunofluorescencently labled full mouse brain sections provide a more extensive overview presenting more brain areas and cell types. 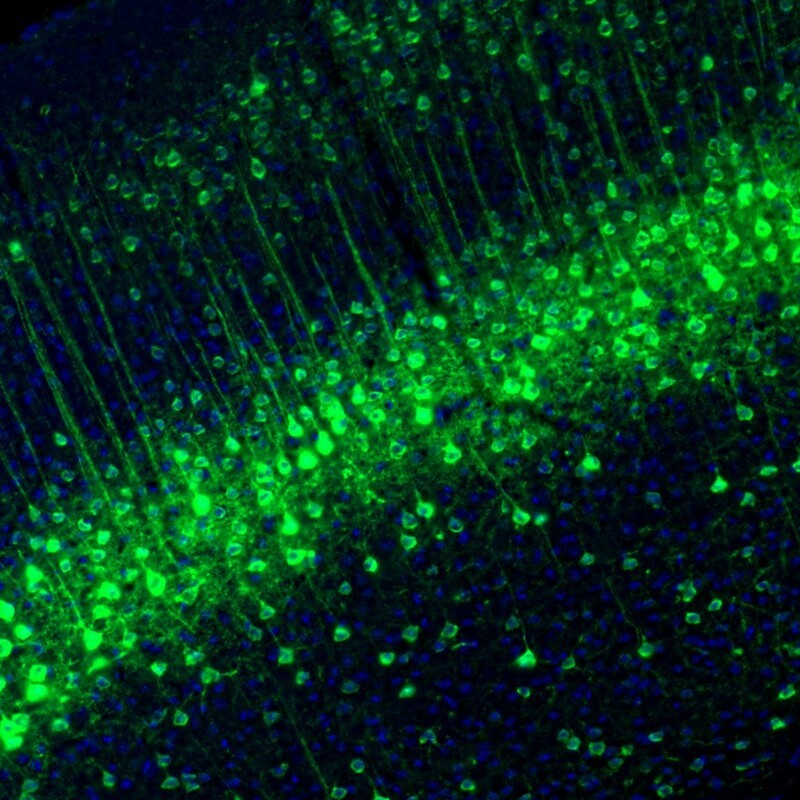 A selected set of brain relevant genes are profiled in the mouse brain providing detailed information on the regional and cellular location of proteins in the mammalian brain. N-terminal EF-hand calcium binding protein 1. Subsets of neurons showed distinct positivity in cell bodies and dendrites. Main location of the positive neurons is layer 4 of the cerebral cortex. The Cell Atlas provides high-resolution insights in the spatial distribution of proteins within cells. Firstly, it contains mRNA expression profiles from a diverse panel of human-derived cell lines (n=56) representing different germ layers and tissues. Secondly, the atlas contains high-resolution, multicolour images of immunofluorescently labeled cells that detail the subcellular distribution pattern of proteins in these cells. By default U-2OS cells and 2 based on expression selected cell lines are probed with each antibody. The cells are stained in a standardized way where the antibody of interest is visualized in green, the microtubules red, the endoplasmic reticulum yellow, and nuclei counterstained in blue. The images are manually annotated in terms of spatial distribution to 30 different cellular structures representing 14 major organelles. The annotated locations for every protein are classified as main and additional, and assigned a reliability score. Protein localized to the cytosol in human and mouse cells, and expressed in a cell cycle dependent manner. The location has been validated by siRNA mediated gene silencing, analysis of GFP-tagged protein and paired antibodies. The Human Pathology Atlas (published in Science) is based on a systems-based analysis of the transcriptome of 17 main cancer types using data from 8,000 patients. In addition, we show a new concept to present patient survival data, called Interactive Survival Scatter plots, and in the atlas, we present more than 400,000 such plots. A national supercomputer center were used to analyze more than 2.5 petabytes of underlying publicly available data from the Cancer Genome Atlas (TCGA) to generate more than 900,000 survival plots describing the consequence of RNA and protein levels on clinical survival. The Pathology Atlas also contains 5 million pathology-based images generated by the Human Protein Atlas consortium. The Research Article in Science reports several important findings related to cancer biology and treatment. Firstly, a large fraction of genes is differentially expressed in cancers - and in many cases - have an impact on overall patient survival. The research also showed that gene expression patterns of individual tumors varied considerably, and could exceed the variation observed between different cancer types. Shorter patient survival was generally associated with up-regulation of genes involved in mitosis and cell growth, and down-regulation of genes involved in cellular differentiation. The data allowed the researchers to generate personalized genome-scale metabolic models for cancer patients to identify key genes involved in tumor growth. Nuclear expression in varying fractions of tumor cells in all cancer types at protein level and expressed in all cancers at mRNA level. 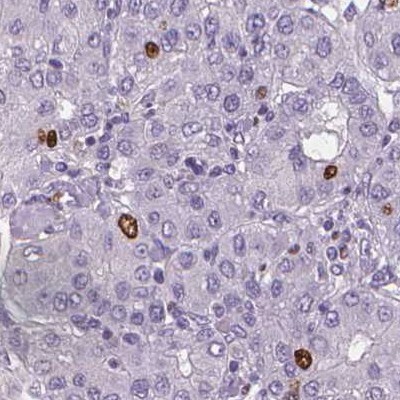 High expression of this gene is associated with unfavourable prognosis in renal, liver and pancreatic cancer. The Human Protein Atlas project was initiated in 2003 by funding from the Knut and Alice Wallenberg foundation. Primarily based in Sweden, the Human Protein Atlas project involves the joint efforts of the Royal Institute of Technology in Stockholm, Uppsala University, Uppsala Akademiska University Hospital, and more recently also Science for Life Laboratory based in both Uppsala and Stockholm. Formal collaborations are with groups in India, South Korea, Japan, China, Germany, France, Switzerland, USA, Canada, Denmark, Finland, The Netherlands, Spain, and Italy. The pathologists and staff at the Pathology Clinic, Uppsala University Hospital, Uppsala, Sweden, are greatly acknowledged for all efforts regarding handling and diagnostics of the tissues used in the Human Protein Atlas. Dr Sanjay Navani and Lab Surgpath, Mumbai, India, are also acknowledged for the major contribution regarding annotation of immunohistochemically stained normal and cancer tissues. The first version of the Human Protein Atlas website was launched in 2005 and contained protein expression data based on approximately 700 antibodies. Since then, each new release has included more data and also added new functionalities and new features to the website. Important additions are the inclusion of cell-line data in version 2, and the inclusion of confocal images showing subcellular localizations in version 3. Version 3 also included a new search function that allowed advanced query based searches. In version 4, the overall database structure was shifted from a previously antibody-centric structure, to a gene-centric structure in order to include information on all genes predicted by Ensembl. The next major restructuring came in 2010 with the version 7 when the concept of annotated protein expression for paired antibodies (two independent antibodies directed against different, non-overlapping epitopes on the same protein) was introduced. In 2013, the version 12 of the protein atlas database was complemented with transcriptomics profiles from 27 normal tissues, and the format with four sub-atlases was introduced. Version 13 was released at end of 2014 and included an analysis of all major organ and tissues in the human body using transcriptomics and antibody-based profiling. The results were summarized on interactive knowledge-pages divided into 7 human proteomes and 27 tissues and organs. In version 14, a new mouse brain atlas was introduced, and in version 15 RNA-seq data from the Genotype-Tissue Expression (GTEx) consortium was included. In version16, a new Cell Atlas was launched with subcellular localization corresponding to over 12,000 protein-coding genes, together with a new approach for visualization of antibody validation and the inclusion of transcriptomics data from the FANTOM5 program.